Just listened to the DJ Soulera 5150 show, one word, AWESOME, only knew a handful of the tracks, and to be honest, the standard was that good right through I can't pick out fave's, what a way to end the show though, General Lee. with guest George Miller Jr.
Sweet soul has been the soundtrack of the chicano cultura for years! there was a lot chicano groups from texas and ca putting out records with that soulful sound we like..thee midnighters,little joe and the latinaires,sunny and the sunliners,royal chessmen to name a few..of course the raza continued to dig deeper and flooded the barrios with the sweet soul sound like the east side stories..Frankie Karl,The Escorts,Van Mcoy..there's always been chicano collectors but they kept a low profile..now days with internet,ebay,soul source etc youre starting to see a lot of "souleros" as we say emerge..also these records with that soulero sound are easier to reach now thanks to the internet..theres so many unknown gems in the hands of these collectors who still do not do the internet thing and expose all their heat! We strange members of the Manchester Soul And Food Club, with our flambouyant socks and natty haircuts, call this stuff Shabeen Soul. I have always been intrigued by the images on the CD covers & else where, why are the women depicted as half skeletal with sunken eyes & sewn up its...not sure how this fits in with the music & what significance it has, I may not have explained this very well, but if anyone can understand what I'm on about would love to know what its all about & even the history......anyone ??? Kev the vocals are fab. Pete the band coulda' done with a bit more practice maybe !! Knocks me out Kev, one of my top faves mate and everything I love about a SOUL record. 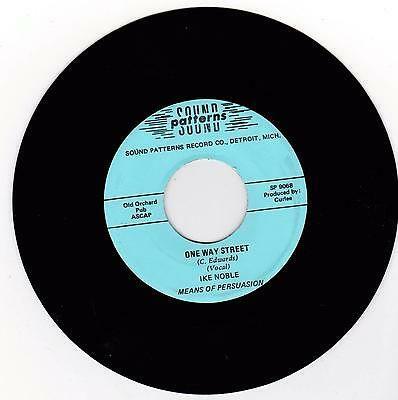 Soul at street level and so reminds me of another fave ... Frankie Seay "Hold On"
This one really seems to be making a big noise in LA at the moment......a constant spin for Soulera 5150 and it's in my playbox too. Immaculate soul record. Another that blew me away on first hearing .. Anyone know if the C&J release is the same cut as credited to Ike Noble on Sound Patterns? Cheyenne Wyoming ain't exactly reknowned for it's soul output but ..
Not an in-depth book by any means, but here's a good piece for those unfamiliar with this scene. Excerpted from Wax Poetics' article. The NORTHERN SOULEROS have nothing to do with souleros ball two totally different groups . I don't know why everyone thinks that we the NORTHERN SOULEROS are part of them. Cheers guys, play stuff like this a fair bit on my radio show. For the next one will be playing a bunch of un-released Futures tracks in the same vain. Every tuesday evening, every other month, back on in August. The below is really up my street, anyone tell me what it is ? WOW!! This is fantastic. F@king wants list going up again. You know me Kev, generally appreciate deep, ballad and below the Mason Dixon line stuff. Like many sub-genres there's good, not so good and downright awful to one's individual tastes. Don't generally go for sickly sweet but a good down tempo side with good impassioned vocals always gets my ear. Nowt wrong with uptempo stuff, we've all liked it and still do if it's good whether old or new however it's the slower sides that I and many others missed out on during our "Northern" days that really do it for me nowadays. I wonder if the Low Riders ponder our existence? Imagine telling them about the Jim Wray Lounge at Yarmouth!